Minnesota, 1960: Corvairs Battle For Ice Racing Supremacy With Caravelles And 356s! 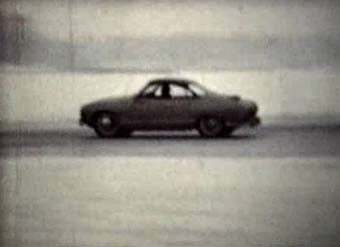 My grandfather was quite the rally and ice-racing fanatic back in the 1950s and 1960s (running mostly Porsche 356s and Saab 93s) and now I've got a couple of his 8mm movies, shot in 1960. Minnesota, February 1967: Let&apos;s Go Racing! The image quality isn't so good; in fact, identifying the cars is much like trying to extract useful information from the Zapruder Film (which was shot using similar hardware). The ASA 24 film means there are some dark parts, and my film-to-video conversion technique (camcorder + projector) doesn't help matters. There's definitely a Corvair, a 356, and a Beetle, and what appears to be a Renault Caravelle. Maybe a Sprite as well? Mostly you just get atmosphere from this; the sense that it's really freakin' cold, with maybe a mournful whistling of grim Scandinavian-style wind through the skeletal trees, punctuated by the roar of engines at rod-throwing revs and the occasional crunch of sheetmetal on snowbanks. You might check out this Land-O-Lakes SCCA history of racing in Minnesota when you're done here.